Right now I feel as busy as I do when I am in actual film production. It’s incredible just how much needs doing for Cannes, for the next project, to sustain all that unpaid work and keep food on the table and a roof over my head! 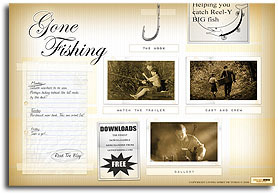 I have been working on the poster, which is very close now, and on the new website for Gone Fishing. Joe Gardner put together a first crack at the design (click on the pick to see a bigger version) which I like very much. However, I do want to try something completely different too, something that captures the spirit of a summer day, the kind you remember from when you were a kid. That bright and shiny magic. 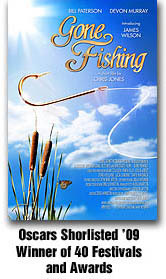 The current design is very well executed, I just don’t want to look too much like all that we are is a fishing movie. Having said all that, we may end up going with this design as it works so well. Let’s see what magic Joe comes up with in the next day or so. 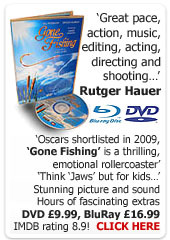 One of the Associate Producers on Gone Fishing, Simon VanDerSpeol, got in touch with me about a documentary on Spitfires that he had made completely off his own back. The story of his journey from small idea to premiere on the History Channel was so interesting, I did a Podcast with him last week. You can see a clip from his doc (which he funded out of his own pocket) and listen to the podcast here. It’s fascinating for anyone into docs.